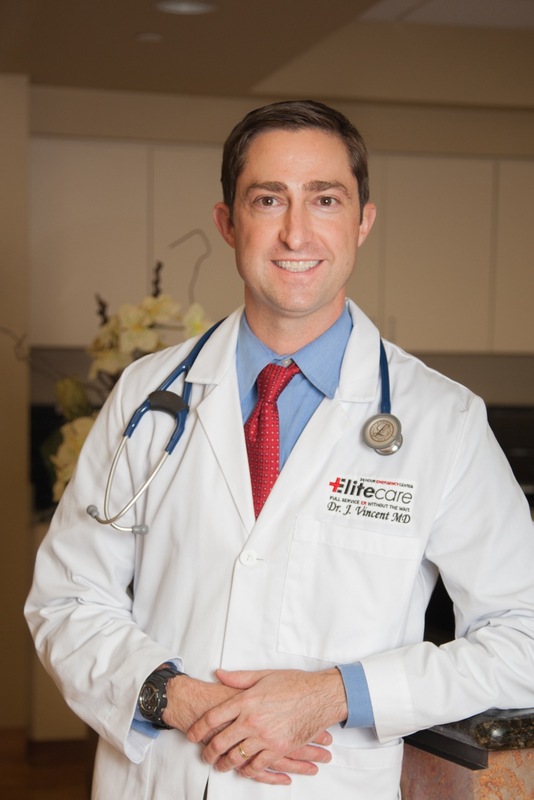 Elite Care welcomes our new Medical Director, Dr. James Vincent MD, FACEP, FAAP to head up our League City, TX 24 hour emergency center beginning February 1, 2016. Dr. Vincent has been practicing Emergency Medicine for over 14 years and has achieved numerous professional accolades since receiving his medical degree from UTMB Galveston. Dr. Vincent also is a Credentialed ImPACT™ Consultant (CIC) and serves as Concussion Program Director for Elite Care’s ImPACT™ Concussion Testing for all Elite Care 24 Hour ER locations across Texas. More about ImPACT™ Concussion Testing. Dr. Vincent attended Medical school At University of Texas Medical Branch (UTMB) in Galveston TX. In 2003 he completed his Residency in Emergency Medicine UT Houston / Hermann Hospital in Houston, and obtained his fellowship in Pediatric Emergency Medicine at Texas Children’s Hospital / Baylor College of Medicine in Houston, TX. While at Clear Lake Regional Medical Center, Dr. Vincent helped establish a nested pediatric ER with 10 hours of daily coverage. He was also recognized on the HCA “Top 10” list for pediatric ERs in July 2010. After joining Elite Care 24 Hour ER as Pediatric Medical Director in 2014, Dr. Vincent established testing labs at eight Elite Care locations for the acute evaluation of concussions using the ImPACT™ neurocognitive test. Dr. Vincent is Board Certified in Emergency Medicine and Pediatric Emergency Medicine and is the only Credentialed ImPACT™ Consultant in League City.